Definition at line 90 of file RegBankSelect.h. Assign the register banks as fast as possible (default). Greedily minimize the cost of assigning register banks. This should produce code of greater quality, but will require more compile time. Definition at line 95 of file RegBankSelect.h. 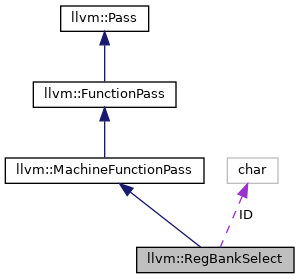 Create a RegBankSelect pass with the specified RunningMode. Definition at line 99 of file RegBankSelect.cpp. References llvm::MachineInstrBuilder::addDef(), llvm::AnalysisUsage::addRequired(), llvm::MachineInstrBuilder::addUse(), assert(), llvm::SmallVectorTemplateCommon< T >::back(), llvm::RegisterBankInfo::ValueMapping::BreakDown, llvm::MachineIRBuilder::buildInstrNoInsert(), llvm::RegBankSelect::RepairingPlacement::canMaterialize(), llvm::SmallVectorImpl< T >::clear(), llvm::MachineFunction::CloneMachineInstr(), llvm::RegisterBankInfo::copyCost(), llvm::RegisterBankInfo::OperandsMapper::createVRegs(), llvm::dbgs(), llvm::SmallVectorImpl< T >::emplace_back(), llvm::SmallVectorBase::empty(), llvm::empty(), llvm::CallingConv::Fast, llvm::MachineFunctionPass::getAnalysisUsage(), llvm::MachineBlockFrequencyInfo::getBlockFreq(), llvm::RegisterBankInfo::getBreakDownCost(), llvm::RegisterBankInfo::InstructionMapping::getCost(), llvm::MachineBasicBlock::getFirstTerminator(), llvm::RegisterBankInfo::getInstrMapping(), llvm::RegBankSelect::RepairingPlacement::getKind(), llvm::MachineIRBuilder::getMF(), llvm::ilist_node_with_parent< NodeTy, ParentTy, Options >::getNextNode(), llvm::RegBankSelect::RepairingPlacement::getNumInsertPoints(), llvm::RegisterBankInfo::InstructionMapping::getNumOperands(), llvm::MachineInstr::getOperand(), llvm::RegBankSelect::RepairingPlacement::getOpIdx(), llvm::MachineOperand::getParent(), llvm::MachineInstr::getParent(), llvm::MachineOperand::getReg(), llvm::RegisterBankInfo::getRegBank(), llvm::getSelectionDAGFallbackAnalysisUsage(), llvm::MachineRegisterInfo::getType(), llvm::RegisterBankInfo::OperandsMapper::getVRegs(), llvm::RegBankSelect::RepairingPlacement::hasSplit(), llvm::RegBankSelect::RepairingPlacement::Impossible, llvm::RegBankSelect::RepairingPlacement::Insert, llvm::MachineOperand::isDef(), llvm::TargetPassConfig::isGlobalISelAbortEnabled(), llvm::MachineInstr::isPHI(), llvm::TargetRegisterInfo::isPhysicalRegister(), llvm::MachineOperand::isReg(), llvm::MachineInstr::isTerminator(), llvm::MachineInstr::isUnconditionalBranch(), llvm::RegisterBankInfo::InstructionMapping::isValid(), llvm::RegisterBankInfo::PartialMapping::Length, LLVM_DEBUG, llvm_unreachable, llvm::max(), MI, llvm::RegBankSelect::RepairingPlacement::None, llvm::RegisterBankInfo::ValueMapping::NumBreakDowns, llvm::RegisterBankInfo::ValueMapping::partsAllUniform(), llvm::printReg(), llvm::MachineInstr::readsRegister(), llvm::RegBankSelect::RepairingPlacement::Reassign, Reg, llvm::RegisterBankInfo::PartialMapping::RegBank, llvm::report_fatal_error(), llvm::MachineRegisterInfo::setRegBank(), llvm::size(), std::swap(), llvm::RegBankSelect::RepairingPlacement::switchTo(), and llvm::RegisterBankInfo::InstructionMapping::verify(). Definition at line 636 of file RegBankSelect.h. References llvm::MachineFunctionProperties::NoPHIs, runOnMachineFunction(), and llvm::MachineFunctionProperties::set(). Definition at line 621 of file RegBankSelect.h. Definition at line 625 of file RegBankSelect.h. References llvm::MachineFunctionProperties::IsSSA, llvm::MachineFunctionProperties::Legalized, and llvm::MachineFunctionProperties::set(). Definition at line 631 of file RegBankSelect.h. Walk through MF and assign a register bank to every virtual register that are still mapped to nothing. The target needs to provide a RegisterBankInfo and in particular override RegisterBankInfo::getInstrMapping. Definition at line 651 of file RegBankSelect.cpp. 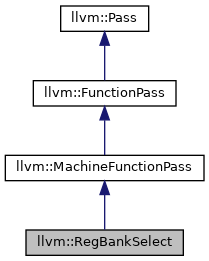 References llvm::dbgs(), llvm::DisableGISelLegalityCheck, F(), llvm::MachineFunctionProperties::FailedISel, llvm::CallingConv::Fast, llvm::MachineFunction::getFunction(), llvm::MachineFunction::getName(), llvm::MachineFunction::getProperties(), llvm::MachineFunctionProperties::hasProperty(), LLVM_DEBUG, llvm::machineFunctionIsIllegal(), llvm::reportGISelFailure(), and llvm::MachineIRBuilder::setMBB(). Definition at line 92 of file RegBankSelect.h.